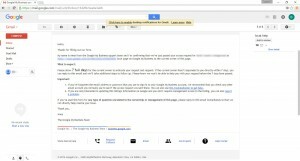 How to get your Google Plus and My Business page back! Your businesses online presence is vital in today’s digital environment. Having a business presence on Google is arguably one of the most important components in any businesses online marketing strategy. For small business owners it can be challenging to get and keep all of your most important digital assets in one place. We want to share our personal experience in recovering Google accounts, and don’t forget to check out our guide to creating your businesses Google presence for directions that will ensure you don’t run into this problem at all, or again. Google requires the use of a Gmail account to manage all of its apps, including Google Plus, My Business, AdWords, and YouTube. On many instances, we have encountered an issue where a business owner has allowed someone else to create a google account to manage apps like Google Plus or My Business, and were left stranded with no access to their businesses information once this individual has moved on. Dealing with Google can be a headache when you are trying to run a business at the same time. The procedure outlined below will offer you the quickest and easiest path to re-claiming your Google plus and My business assets if you or a client of yours ever runs into this problem. Sign in to Google using the account you use to manage your business. Enter the name or address of your business and select your business from the drop-down menu. When you choose your business, you’ll see a dialogue box letting you know that someone else has verified the business. Allow a full 7 days for the current listing owner to respond to your request. If the owner of the current page responds, you can move forward with accepting the transfer of ownership. This is a rare outcome. If the current owner does not respond, you will receive an email about 3 days in letting you know that google has noticed there has been no activity. If you don’t hear back after the full 7 days, contact support by opening the confirmation email form Google and requesting a call. This is the absolute fastest route to getting a person on the phone to help you finish the process. At this point the Google rep will call you, and verify a few more pieces of information. Once they have found your business page, they are able to release it and they will walk you through going back to claim your page. One of the most beautiful things about this process is that all of your stored information is transferred back to you. This means you still have all of your activity, photos, and reviews ready for you to actively manage, all in one convenient location. We hope these instructions come in handy if you ever need them! Cyberbility’s guide to creating your businesses Google presence.